Apple’s future – who is Apple attracting? Apple is drawing a potentially profitable audience: non-Apple households shopping at Apple’s retail stores have a larger than average household, with two-thirds (67%) having 3 or more household members. Certainly, those other members might benefit from an additional PC. While five-ninths (56%) have more than one Home PC, that’s smaller than the over two-thirds (68%) of Apple households with two or more Home PCs. Attracting and serving future generations has been a persistent part of Apple’s strategy, and that might be needed in the present, although towards an even-younger audience. The almost-there untapped-market of households without Apples that are already frequenting Apple retail stores includes a disproportionately-high concentration of kids. In non-Apple households shopping at Apple retail stores, over one-fourth (28%) have kids age 7 to 12, and 29% have kids 6 and under. That’s nearly double the rate among Apple households, at 16% and 15%, respectively. 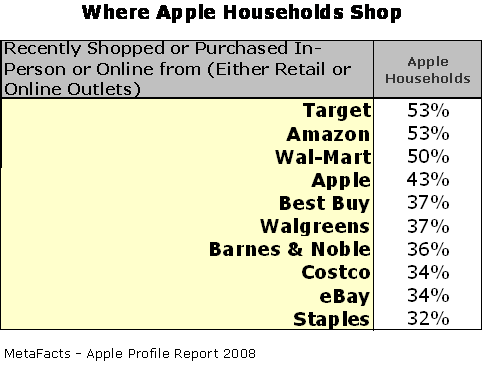 One other mildly positive sign for Apple’s future: A fair number of non-Apple households shop at the Apple website. 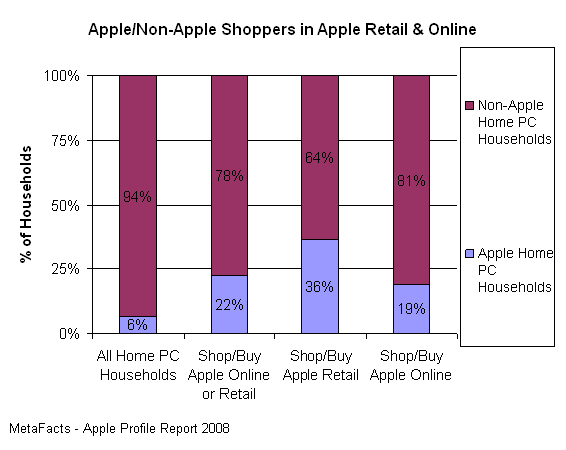 7% of non-Apple households have recently shopped online with Apple, compared with 24% of Apple households. Although this non-Apple number is not huge, it’s noticeable. Apple is making many efforts beyond personal computing to drive traffic to its sites, stores, and brand. Beyond personal computers, this ranges from iPhones to iPods. The life of the Apple computer, longer or shorter? Just how “different” and elite are Apple customers – socioeconomically, behaviorally, and attitudinally? Apple loyalty – still faithful? The halo effect – has the iPod changed Apple’s PC business? Just how more creative are Apple’s users than the Windows crowd? Apple & the future digital home?